1Department of Oncology, Transplants and Advanced Technologies in Medicine, Division of Paleopathology, University of Pisa, 2Department of Archaeology and History of Arts, Section of Medieval Archaeology, University of Siena and 3Department of Clinical Physiopathology, Section of Clinical Radiology, University of Florence, Italy. Objective. According to the written sources several members of the famous Medici family of Renaissance Florence suffered from an arthritic disease, called ‘gout’ by contemporary physicians; a palaeopathological study allowed verification of the true nature of the ‘gout of the Medici’ referred by archive document data. Methods. The skeletal remains of the Grand Dukes and their families, buried in the Basilica of San Lorenzo in Florence, were examined macroscopically and submitted to X-ray investigation. Results. Out of 15 investigated individuals, two cases of diffuse idiopathic skeletal hyperostosis (DISH), with ossification of the anterior longitudinal ligament and massive hyperostotic changes of the extra-spinal ligaments, were detected in the skeletons of the Grand Dukes Cosimo I (1519–74) and his son Ferdinand I (1549–1609). The left foot of Ferdinand also revealed typical lesions of the uratic gout, confirming the archive data, which describe the disease in detail. Conclusions. The association between DISH and elite status, highlighted in recent research, receives further confirmation in the present study, furnishing evidence to the significance of this disorder as a lifestyle indicator, linked specifically with a high-caloric diet, consequent obesity and type II diabetes mellitus. Furthermore, the coexistence between DISH and gout observed in Ferdinand represents the first documentation of this association in the palaeopathological literature. KEY WORDS: Renaissance, Florence, Medici, Cosimo I, Ferdinand I, Diffuse Idiopathic Skeletal Hyperostosis, Gout. The ‘Medici Project’ is a multidisciplinary archaeological and palaeopathological investigation to perform a study of 49 funerary depositions of the Medici Grand Dukes, in the famous Medici Chapels of the Basilica of San Lorenzo in Florence. The Medici Project represents a unique opportunity to reconstruct the health and lifestyle of the members of this important family of the Italian Renaissance. Up until now 15 tombs, including the burials of nine children, have been investigated [1–3]. The clinical history of the Medici family, including the reports of the ambassadors and court physicians, is well known from the extremely rich archives that were examined and published in the fundamental opera of the Florentine physician and historian Gaetano Pieraccini . From these records it emerges that several members of the Medici family suffered from arthritic diseases. The term frequently reported by contemporary sources to indicate these morbid episodes, characterized by violent pain in the hands, feet, shoulders, knees and thoracic-lumbar spine, is ‘gout’. Gout, also called the ‘disease of kings’ for its association with a lifestyle typical of the upper classes, seems to have been a family disease among the Medici, as attested by the nickname ‘the gouty’ attributed to Piero (1416–69). It should be remembered that the term ‘gout’ was used in those times to indicate several pathological conditions of rheumatic origin; the word was first introduced in the 13th century and derives from the Latin gutta, which means ‘drop’, similar to a liquid falling on the foot and reflecting the idea that this condition was caused by an imbalance of a humour that had entered the affected joint, causing pain and inflammation. The distinction between gout and rheumatism was introduced later in the 17th century . Palaeopathology allows verification of the nosological information obtained from the written sources and clarification of the nature of the rheumatological condition that afflicted the Medici. Among the individuals studied so far, the skeleton of Cosimo I (1519–74), 1st Grand Duke of Tuscany, and those of his son Ferdinand I (1549–1609), 3rd Grand Duke of Tuscany, have shown evidence of arthritic diseases. The archive data indicate that Cosimo I suffered from several illnesses, including an acute articular disorder of the right knee, named ‘gout’ by the court physicians, which appeared at the age of 49 and 52–53 yrs . The palaeopathological study of Cosimo’s remains reveals a series of lesions of the axial and appendicular skeleton. The skull shows hyperostosis frontalis interna. The anterior longitudinal ligament on the right-hand side of the column is ossified at the level of the T6, T7 and T8 vertebral bodies; this flowing ossification forms a bony bridge between the vertebrae, appearing as a continuous line of bumps. Two other vertebrae, L2 and L3, are fused on the left-hand side through a bony bridge. Several thoracic and lumbar vertebrae present syndesmophytes, but without vertebral fusion. Marked bone spurs at the insertion of the ligamenta flava are also visible. Intervertebral disks and articular surfaces are normal. Ligament and tendon attachments of the appendicular skeleton show enthesopathies, in particular at the level of clavicles, humeri, ulnae, radii, coxal bones, femurs, patellae, tibiae and calcanei. A diffuse and severe arthritis affecting the lower thoracic and lumbar spine and the great joints is also visible. As far as Ferdinand I is concerned, the historic documentation attests that he suffered from many acute attacks of gout, generally of the left foot, typically positioned in the big toe, from the age of 33 yrs until death. The first attack seems to have been dated back to 1582, when Ferdinand wrote to his brother, the Grand Duke Francesco I, referring that he was confined to bed or chair because of ‘. . . some catarrh has fallen down to my left foot. By God’s grace, may it not be podagra!’. In 1591 the court physician Giulio Angeli accurately describes a typical gout attack: ‘yesterday the gout started to pinch the big toe of the Grand Duke’s left foot and then continued to advance rapidly! Overnight the toe has become swollen, inflamed and painful’. The crises afflicted the Grand Duke also in the following years; furthermore, he started to become obese at the age of 41 . The paleopathological investigation carried out on the skeleton of Ferdinand I reveals pathological features similar to those observed in his father. The vertebral bodies from T5 to T11 are fused in a unique block for the ossification of the right anterior ligament, conferring the typical aspect of a ‘candle wax’ to this spine segment (Fig. 1A and B, arrows; Fig. 1C). The body of several cervical and thoracic vertebrae presents partial ossification of the right anterior ligament, but with no formation of bony bridges between the vertebrae. The intervertebral spaces and the apophyseal joints are normal. Ossifications of ligamenta flava, interspinal and supraspinal ligament insertions are largely present. The extra-spinal ligaments show massive hyperostotic changes. Enthesopathies were present at the muscular insertion of clavicles, scapulae, humeri, ulnae, coxal bones, femurs, patellae, tibiae and calcanei. The thyroid cartilage and the epiglottis are ossified and well preserved. Large rough bilateral calcifications of the sternocostal cartilages of the first and of the last ribs are present, leading to a sternum with multiple ribs attached. Ferdinand I was affected by diffuse OA, involving not only the spine and major joints, but also several articulations of his hands and feet. Furthermore, the skeleton of Ferdinand shows a peculiar lesion in the left foot. The interphalangeal joint of the big toe presents cavitations, erosions and osteophytic margins (Fig. 2A, arrow). At the peri-articular and articular surface of the joint a ‘scooped-out’ defect (Fig. 2C), with partial destruction of the sub-chondral plate (Fig. 2D), is also visible. X-ray examination reveals an evident sclerotic margin, which involves both bones of the joint (Fig. 2B, arrow). The changes observed in Cosimo I and Ferdinand I meet the standard major criteria established for the diagnosis of diffuse idiopathic skeletal hyperostosis (DISH) . Both skeletons showed hyperostosis of the column, with the involvement of at least three contiguous vertebrae in Cosimo I, and up to seven vertebrae in Ferdinand. Such changes were limited to the right side of the thoracic segment and diffuse ossifications of the articular ligaments and entheses were present. Features often associated with DISH, such as hyperostosis frontalis interna, ossification of the neck and rib cartilages and massive OA, confirm the diagnosis. The lack of evidence of these diseases in the written sources may be due to the fact that, despite the dramatic radiological aspect, DISH is generally asymptomatic, as its manifestations are limited to back stiffness and mild pain. Paleopathological literature has reported several cases of DISH from different geographical sites and different periods [7, 8]; extensive studies have also been carried out to evaluate the incidence of DISH in large skeletal series [9–12]. The aetiology of this condition remains uncertain, but has been related to various metabolic disorders, in particular obesity and type II diabetes mellitus. Recent studies have highlighted a link between the incidence of diffuse idiopathic skeletal hyperostosis and high social status, with particular regard to lifestyle and nutritional patterns. The Italian Renaissance aristocratic classes had access to a wide variety of food resources. Historical data report a diet based on wine and meat, occasionally enriched by eggs and cheese and, on penitential occasions, by fish. The consumption of vegetables was scarce and fruit was almost totally absent from alimentation . A palaeonutritional study performed recently on the Medici Grand Dukes and their families confirmed the written sources. Carbon and nitrogen stable isotope analysis revealed a diet very rich in meat, as demonstrated by the _15N high values at the level of the carnivores. The _13C values, related to the consumption of fish, revealed an intake of marine proteins at 14–30% . The present study seems to further confirm the association between DISH and elite status. Among the five individuals belonging to the Medici family of >40 yrs of age that have been studied so far, two were affected by DISH. Furthermore, it is worth mentioning the case of Cosimo ‘the Elder’ (1389–1464), whose remains showed the stigmata of this condition as well . Despite the narrowness of the sample, the high incidence of DISH in the Medici family is remarkable and a significant lifestyle indicator, supporting the link between social status and risk of developing DISH in mature age. FIG. 1. The DISH of Ferdinand I: (A) anterior view of the column with ossification of the anterior right vertebral ligament, at the level of the 5th–11th thoracic vertebral bodies, conferring the typical ‘candle wax’ appearance (arrows); (B) right lateral view of the thoracic column with DISH (arrows); (C) anteroposterior X-ray of the thoracic column. FIG. 2. The gout of Ferdinand I: (A) left foot with lesion at the level of the interphalangeal joint of the big toe (arrow); (B) X-ray of the left foot, showing sclerotic margins of both the bones of the joint (arrow); (C) particular of the left big toe with ‘scoped-out’ defect at the interphalangeal joint of the hallux dorsum; (D) articular surfaces of the interphalangeal joint with partial destruction of the subchondral plate. Furthermore, the case of Ferdinand I is of particular interest for the diagnosis of gout, of which very little evidence has been found in palaeopathology . Genetic and/or environmental factors, with particular regard to diet, may be involved in the aetiology of gout. An alimentation rich in animal proteins, as attested by the palaeonutritional investigation carried out on the Medici family , may have favoured the onset of this disease. An association with obesity, diabetes and hyperinsulinaemia is ascertained . Modern clinical studies report a significant association between diffuse idiopathic skeletal hyperostosis and gout . Not only do the typical skeletal and radiological features observed in the bone remains of Ferdinand I confirm the data reported by the written sources regarding the arthritic left foot gout that affected the Grand Duke, but this represents the first documentation of the coexistence between diffuse idiopathic skeletal hyperostosis and gout attested in palaeopathological literature. Disclosure statement: The authors have declared no conflicts of interest. documented in the palaeopathological literature. Fornaciari G, Brier B, Fornaciari A. Secrets of the Medici. Archaeology 2005;58: 36–41. Fornaciari G, Vitiello A, Giusiani S, Giuffra V, Fornaciari A. The ‘Medici Project’: first results of the explorations of the Medici tombs in Florence (15th–18th centuries). Paleopathol Newsl 2006;133:15–22. Fornaciari G, Vitiello A, Giusiani S, Giuffra V, Fornaciari A, Villari N. The ‘Medici Project’: first anthropological and paleopathological results of the exploration of the Medici tombs in Florence (15th–18th Centuries). Med Secoli 2007;19/2: 521–44. Pieraccini G. La stirpe dei Medici di Cafaggiolo, Vol. 2. Firenze: Nardini Editore, 1986. Nuki G, Simkin PA. A concise history of gout and hyperuricemia and their treatment. Arthritis Res Ther 2006;8(Suppl. 19):S1. Rogers J, Waldron T. DISH and the monastic way of life. Int J Osteoarchaeol 2001; 11:357–65. Aufderheide C, Rodriguez-Martin C. The Cambridge encyclopedia of human paleopathology. Cambridge: Cambridge University Press, 1998. Ortner DJ. Identification of pathological conditions in human skeletal remains. New York: Smithsonian Institution Press, 2003. Arriaza BT. Seronegative spondyloarthropathies and diffuse idiopathic skeletal Hyperostosis in ancient Northern Chile. Am J Phys Anthropol 1993;91:263–78. Arriaza BT, Merbs CT, Rothschild BM. 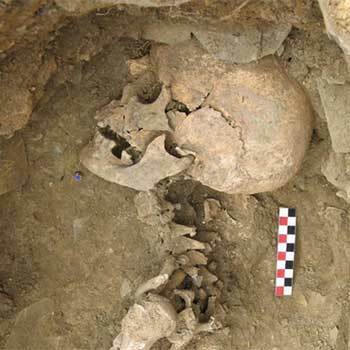 Diffuse idiopathic skeletal hyperostosis in Meroitic Nubians from Semna South, Sudan. Am J Phys Anthropol 1993;92:243–8. Hukuda S, Inoue K, Ushiyama T et al. Spinal degenerative lesions and spinal ligamentous ossifications in ancient Chinese populations of the Yellow River Civilisation. Int J Osteoarchaeol 2000;10:108–24. Jankauskas R. The incidence of diffuse idiopathic skeletal hyperostosis and social status correlations in Lithuanian skeletal materials. Int J Osteoarchaeol 2003;13: 289–93. Grieco AJ. Food and social classes in Late Medieval and Renaissance Italy. In: Flandrin JL, Montanari M, eds. Food. A culinary history from antiquity to the present. New York: Columbian University Press, 1999:302–12. Fornaciari G. Food and disease at the Renaissance courts of Naples and Florence: a paleonutritional study. Appetite 2008;51:10–14. Costa A, Weber G. Le alterazioni morbose del sistema scheletrico in Cosimo dei Medici il Vecchio, in Piero il Gottoso, in Lorenzo il Magnifico, in Giuliano Duca di Nemours. Arch de Vecchi Anat Patol 1955;23:1–69. Roberts C, Manchester K. The archaeology of disease. Ithaca, New York: Cornell University Press, 2007. Cohen MG, Emmerson BT. Gout. In: Klippel JH, Dieppe PA, eds. Rheumatology. 2nd edition, Vol. 2. London: Mosby, 1998:8.14. Littlejohn GO, Hall S. Diffuse idiopathic skeletal hyperostosis and new bone formation in male gouty subjects. Rheumatol Int 1982;2:83–6.